When a site visitor creates a Showcase IDX account. When a site visitor contacts the client through the Showcase IDX interface. 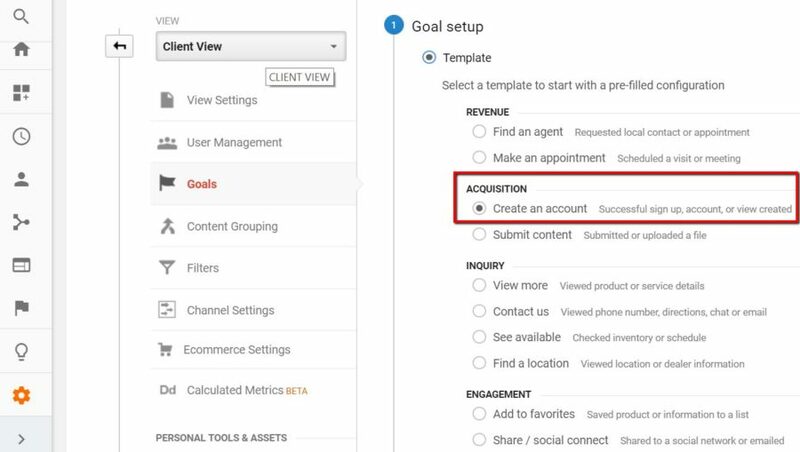 Since these are both critical actions that a site visitor would take on the way to becoming a customer, we’re going to set up both of these as goal conversions in Google Analytics so that we can determine what channel they’re coming from and analyze the efficacy of different campaigns. Full disclosure: Showcase IDX has an excellent tutorial on how to do this, but I’ve added a few extra details that I found helpful. When a site visitor creates an account within the Showcase IDX platform, Showcase IDX labels this as a “New Registration.” Out of the box, the platform sends an Event to Google Analytics, removing any need for custom event configuration. All you need to do is set up a goal conversion based on the Event. First, go into Behavior > Events > Top Events and you should see “Showcase IDX” listed as an Event Category. 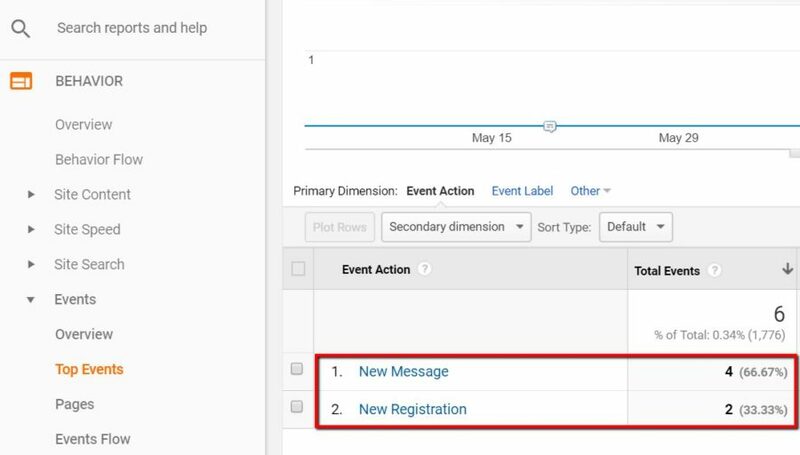 If you don’t see it immediately, widen the date range that you’re analyzing – it’s possible that there weren’t any registrations during a smaller date window. Clicking into these will give you some additional details but for now we’re focusing on setting up Goal Conversions. Now go into Admin and in the “View” column, click on “Goals. ” This is where we’ll set up new goals. At the top, click the red “New Goal” button (you can see I already have Contact Form Submissions and Mobile Click to Call goals set up). From here, Goal Conversions are configured in three parts: Goal setup, Goal description and Goal details. First, make sure “Template” is checked and then select “Create an account” as the goal template for New Registrations. Click the blue “Continue” button at the bottom. By choosing the Create an account template, the goal will be named “Create an account” by default. I prefer to be more descriptive and have renamed it Account Creation (Showcase IDX). Make sure to next check the “Event” box under Type. Then click Continue. This is the most important part. Remember the Event Category and Event Actions that we looked at before? Now we’re going to put them to use. 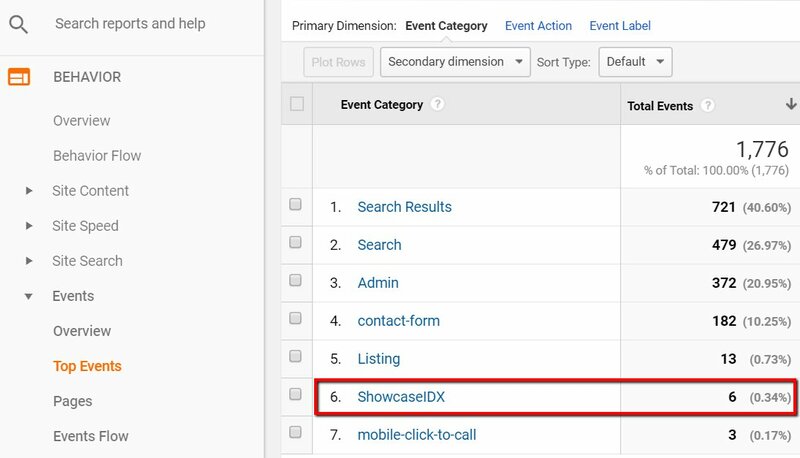 Under the Category box, enter ShowcaseIDX exactly as it’s seen in the Top Events report. Under the Action box, enter New Registration. This will ensure that only Events fitting this specific criteria are tracked as Conversions. Lastly, click Save. 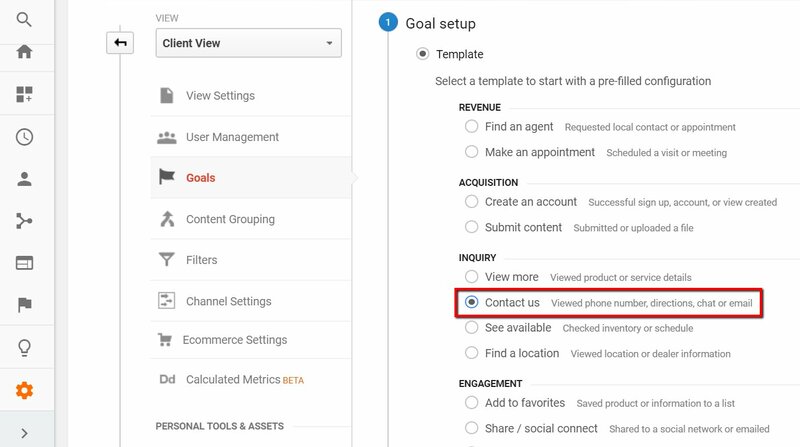 You’ve now setup Goal Conversion tracking for new Showcase IDX registrations. I also recommend setting up a separate Goal Conversion for new messages that are sent through the Showcase IDX platform. This Goal Conversion is even lower in the funnel than New Registrations because prospective customers are going one step further and reaching out. In the Goal description phase, I’ve chosen to rename the Goal as New Message (Showcase IDX). Once you’ve created and saved both of these goals, remember to verify they’re setup correctly by doing a few test submissions. Make sure you’re taking into account any filters for IP address, or Google Analytics opt out browser extensions that would eliminate any test submissions from appearing in the interface. I often test submissions using my phone on data mode (not wifi) – this simultaneously bypasses any IP filters that I have setup in Google Analytics as well as browser extensions. Also keep in mind that while a user can trigger multiple Events within a single website session, Google Analytics will only record one Goal Conversion. If a single visitor sends several messages during a single site visit, GA will only register one Goal Conversion. If you have any questions, tweet me @Berkleybikes, or comment below (Twitter is preferred for faster responses).